We provide complete animal damage repair services throughout Alexandria County and surrounding areas. We are a full service Nuisance Wildlife Control company that provides complete services to remove animals. Once an animal has been removed from your property we will repair any damages these wild animals have caused to your home or business. 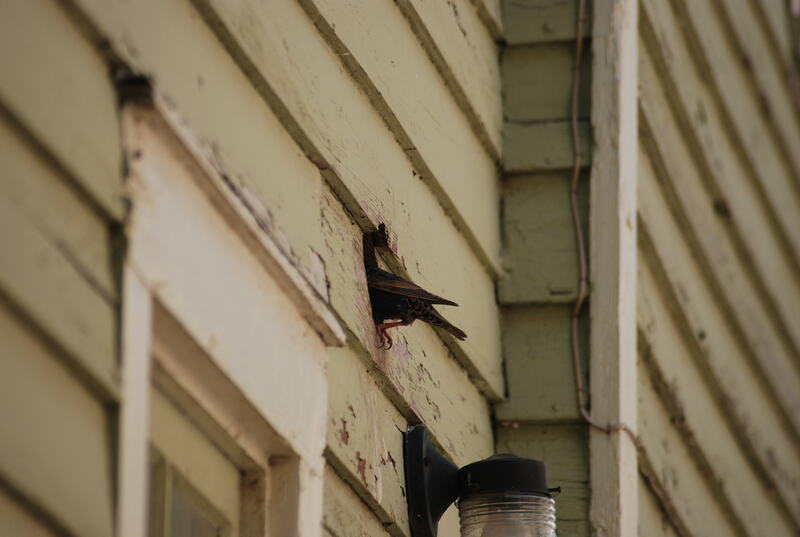 All repair services are performed by our wildlife repair team; we DO NOT out source any of our services. Our Wildlife technicians perform all repairs services. We specialize in contaminated insulation removal and replacement, roofing repairs, sheet rock repairs, duct cleaning, siding repairs, and much more. A Wildlife Exclusion is an alternative method to animal trapping. This is the most humane way to remove an animal living in an attic or crawlspace. With an exclusion an animal is allowed to exit the home naturally without any stress being placed on the animal. Once the animal has moved out and verified by a wildlife technician, necessary repairs and prevention measures can be performed. Animal proofing of the home is an important step to prevent animal re-entry. Wildlife Exclusions is out preferred and most humane method of removing animals. We provide wildlife exclusions throughout Alexandria, VA and surrounding areas. Homeowners face a lot of different types of damages from animals. The most common damage caused to homes is from animals chewing through fascia boards, roofs, tearing vent screens, and attic fans. Most commonly this type of damage is caused by squirrels and raccoons. 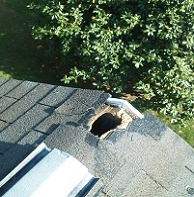 These types of damages are a result of an animal trying to access an attic. As our communities become more urban and or rural areas get smaller animals are searching for alternative birthing places. And what makes a better place than an attic. Our homes are a great place for an animal to have a baby especially attics! They are high up away from danger, dry and comfy. This type of environment gives them a feeling of safety. Great for them, bad for the homeowner. The problem with animals in our attic is the damage they create. These animals are not house trained so they urinate and poop everywhere causing foul odors and spreading bacteria, and destroying our homes insulation by smashing it. Smashing the insulation decreases our homes heating and cooling ability. It is important to have the animal removed as soon as it is discovered. An animal removed quickly can be fairly inexpensive but an animal that has been in an attic for a long time can be very expensive. The longer the animal is in an attic the more damage they have time to do. Don’t delay call our Alexandria Wildlife Experts to resolve all your animal problems. It is estimated that nuisance wildlife will do billions of dollars’ worth of damages in the State of Virginia this year alone. Animals in homes and building are responsible for fires, floods, and electrical malfunctions throughout the State of Virginia each year. If you are experiencing electrical problems, surges in your phone or electrical systems, leaks in your roof or holes in your soffits you should consider giving Animal Control Solutions a call today for a no obligation in home inspection. The most common type of damages caused to commercial properties are caused by bird droppings. Bird droppings are the #1 problem associated with birds. Bird poop is very acidic and can causes damage to most everything it comes in contact with. Home improvement stores lose millions of dollars each year from damaged inventory caused by bird droppings. Most of these losses occur from products in the garden center being pooped on by birds. In addition to inventory losses, there is the cost of constantly having to pressure wash signs, buildings, and sidewalks because of the uncleanliness and unsightliness of the bird droppings to potential customers not to mention the health hazards. We provide commercial customers with such repair services as pressure washing of buildings, sidewalks and signs. We are fully insured to perform Residential and Commercial services throughout Alexandria and throughout the entire State of Virginia.